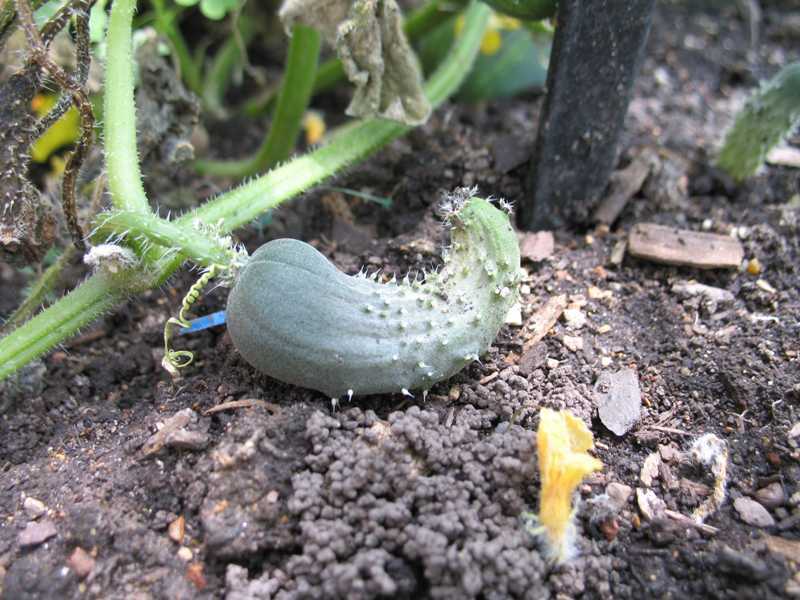 Plants in the cucurbitaceae family such as squash, melons, and cucumbers fail to produce fruit when pollination does not occur. The plants may appear to be healthy, growing well, and flowering, but many or all of the blossoms drop from the plant. Fruits may appear to start developing but become incomplete or die entirely. Weather conditions are key factors in successful pollination. High humidity creates sticky pollen which does not transfer well. Plants in the cucurbit family rely on honeybees for pollination, and honeybees do not fly in cool, cloudy weather. Diseases have dramatically reduced the honeybee population and the ones that are still active remain very susceptible to insecticides. 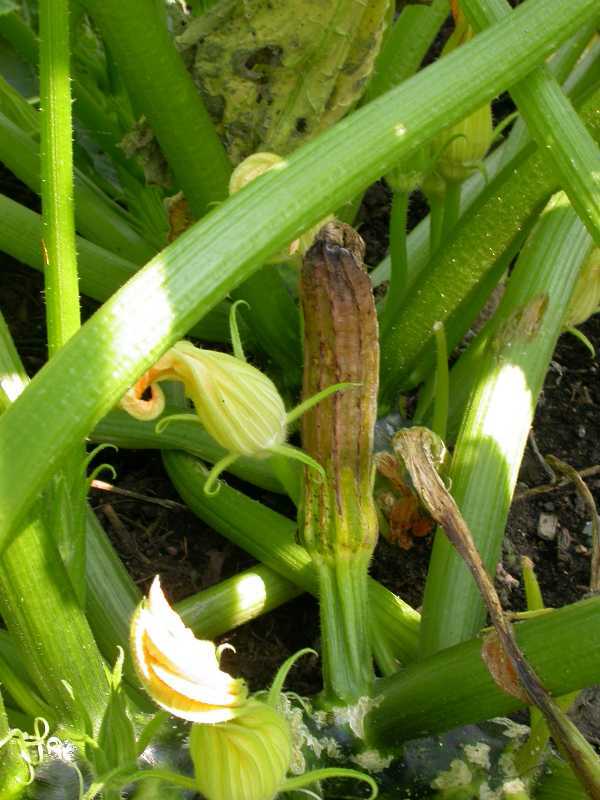 Cucurbits are monoecious; there are separate male and female blossoms on the same plant. The male flowers tend to open first, followed by the female flowers. It is only when both the male and female flowers are open that pollination can occur. The female flower is open for only one day and is most receptive between the hours of 9 AM and 4 PM. During this time the flower must receive about 15 bee visits for maximum pollination. Unfertilized or poorly fertilized flowers fall from the vine. 1. Follow planting guidelines for your time zone. 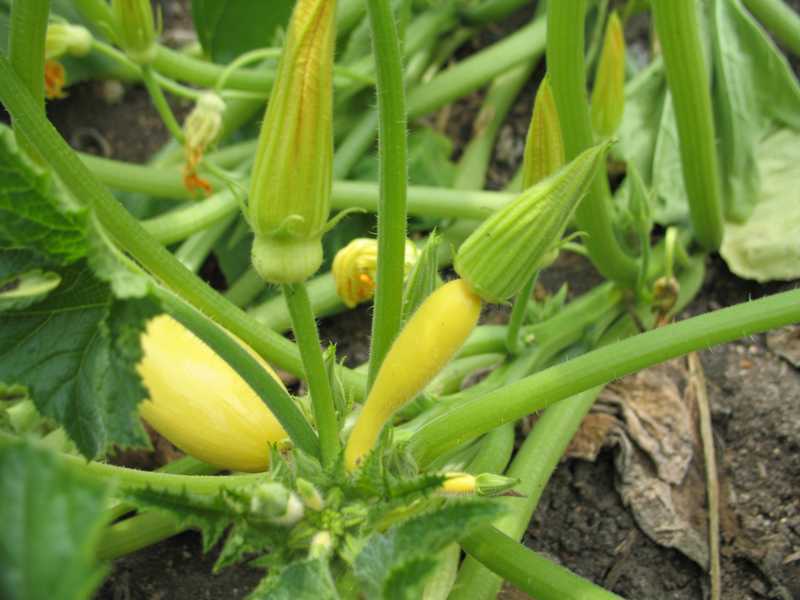 Cucurbits are not likely to successfully pollinate in cool weather. 2. Minimize stress. Make sure your plants have proper spacing, watering, and pest management. 3. Fertilize properly. Avoid excess nitrogen which will promote foliage growth at the expense of blossom formation. 4. Encourage pollinators. Attract and keep honeybees near your garden by companion-planting flowers favored by bees. 5. Use pesticides with caution. If you must use insecticides, avoid their use between 9 AM and 4 PM when honeybees fly. 6. Hand-pollinate cucurbit flowers if needed. See our Visual Guide on "Hand Pollination of Squash and Pumpkins" for directions on how to hand-pollinate cucurbit blossoms. Strategies 1, 2, 4, and 6 are strictly organic approaches. Using an appropriate organic fertilizer would be a viable organic approach to Strategy 3. Using appropriate organic insecticides would be viable organic approaches to Strategy 5. Consult the Organic Materials Review Institute (OMRI™) for organic insecticide options. Hand pollination of cucurbits (Cucurbita) requires distinguishing male and female flowers. The male is on the left, the female is on the right. Females flowers have a small fruit under the flower which only develops if the flower is pollinated. 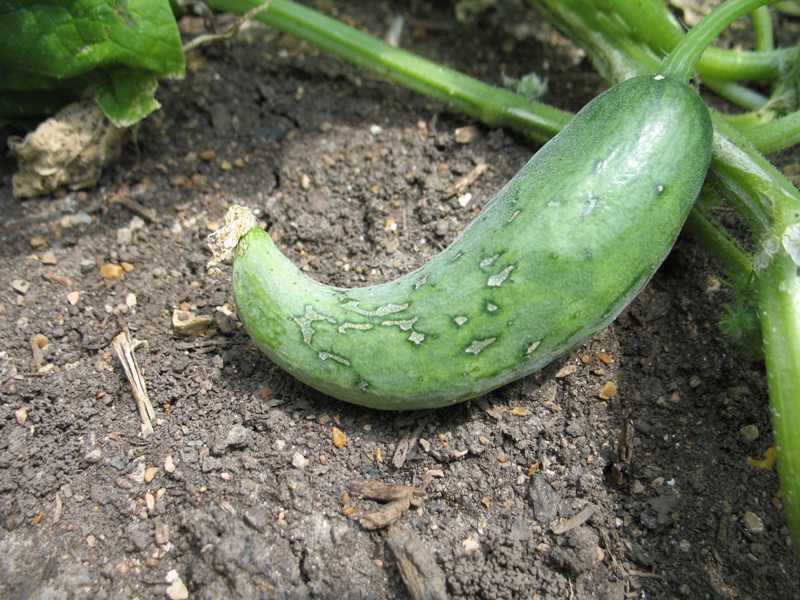 The stunted growth of this cucumber (Cucurbita) is due to poor pollination.